After I purchase, how is the software delivered? An email is sent containing a download button and your product key. It should arrive within 10 minutes! Simply download the installer, run it, enter your key, and you are all set! See here for details. Is there a way to forward the license to another user if I purchase on their behalf? Yes, all they need is their Product Key and a link to the downloads page. Simply pass that information on to them and they will be all set. 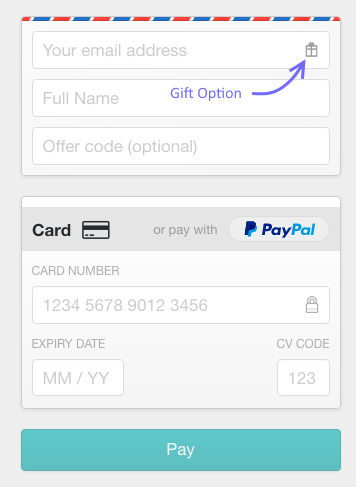 Yes, click the tiny icon in the form during checkout. The receipt will go to your email, and installation instructions will be sent immediately to the giftee. Rather than a trial, incredibly easy refunds are offered at the drop of a hat for the first 70 days after purchase. You get to try out the full version this way, and all it takes is an email saying "Please Refund" if you want your money back! A reminder email is sent half way through the refund period so you don't forget to make a decision. Do you offer a demonstration license for doctors, occupational therapists, and other professionals who are looking into SteadyMouse on behalf of their patients? I have purchased SteadyMouse, now how do I install it on each of my personal computers? Easy! Just access your purchase receipt email from each of your PC's and follow the usual download and installation instructions. More details on multiple computers can be found here in the manual. I did not receive my purchase receipt email! Where is it? If more than 10 minutes has passed, please check your junk mail folder, and then contact support-essential-tremor-filtering@steadymouse.com Sometimes this means there is a typo in your email address. The download button in my purchase receipt email is not working, help! This is usually either a browser problem, or because the purchase receipt was forwarded to an email address different than the purchaser. You can use the downloads page instead. Failing that, try another browser such as Chrome or Firefox. I need an invoice for my purchase. How do I get one? Open your purchase receipt email. Near the bottom locate where it says "Need an invoice for this?". Then click the "Generate" link to the right of that. Can I upgrade or downgrade my license between SteadyMouse 2 and SteadyMouse X? Yes, you can change licenses anytime within the first 70 days. See the full instructions here in the manual. I am struggling to make ends meet and cannot afford SteadyMouse, help! Send an email to financialaid-essential-tremor-filtering@steadymouse.com explaining the situation and we'll work something out. The first priority is helping people. Help, I lost my product key! Please contact support-essential-tremor-filtering@steadymouse.com to get a fresh copy of your original purchase receipt. Can SteadyMouse be used with a wireless mouse, trackball, trackpad, etc? Yes, SteadyMouse works with a large number of devices. The purchase form is giving me difficulty or not working as expected, help! This may be an Internet Explorer issue. Please try again using a different browser such as Chrome or Firefox. Alternatively, you can make the purchase from a different device such as a phone or tablet. Also, if you use an automatic form filler, make sure it entered your data into the right fields. How do I purchase SteadyMouse licenses for multiple users? Run through the normal purchase process multiple times and receive a new email with a new product key each time. Go through the purchase process just once and use the "Quantity" field to select the number of users. You get a single email with one Product Key that has multiple users on it. Is there a way to activate SteadyMouse without an internet connection? Yes, as long as you have another computer that does have internet and a way to transfer files between them. Visit here for instructions. Yes, provided that purchases can be completed using debit-card, credit-card, or PayPal via the standard online form described here. All purchase receipt emails contain a link to generate an invoice. Using this automated process is fast and much appreciated as we do not have the capacity to process invoices manually at the present time unless the order is unusually large. Do you offer volume discounts when purchasing for multiple users? Only for purchases of 10 or more licenses, upon request. If this is the case please contact sales-essential-tremor-filtering@steadymouse.com to receive a discount code. Is there a version for MacOS or other Apple products? What about Linux? Porting of the commercial version is underway and slated for SteadyMouse 3 or 4. The jury is out on Linux. It will depend on if there is a straightforward path. This is an extremely difficult task and will take time. If you would like notification when it is ready you may sign up here. Are you a registered vendor with the U.S. Department of Veterans Affairs? Yes, you can look here to learn more. I'm a reporter interested in writing a story. Is there a press kit available? There is, see here for details. I am a gamer! Does SteadyMouse work in games? Work on this is underway. There is experimental support for most 2D games and some 3D. Can SteadyMouse be used for camera stabilization (aka: Steadicam technology)? Yes, there is experimental support for this. I run Windows in a Virtual Machine such as Parallels or VMWare Fusion. Will SteadyMouse work in that environment? Yes, with some minor changes to the Virtual Machine settings. For Parallels instructions go here and for experimental VMWare Fusion instructions go here. I see that the old free version, SteadyMouse v1.3, was released a while ago, will it still work on newer versions of Windows? The free version worked decently well up through Windows Vista. Windows 7, 8, 8.1, and 10 have seen major issues. These are all fixed in SteadyMouse 2 and later. If you wish to attempt making the free version work you can read through the guidance on the downloads page here and decide if it is worth the trouble.